Relax & View® Video Relaxation System is a unique product and helps to relieve the claustrophobia, stress and boredom often associated with having an MRI scan. 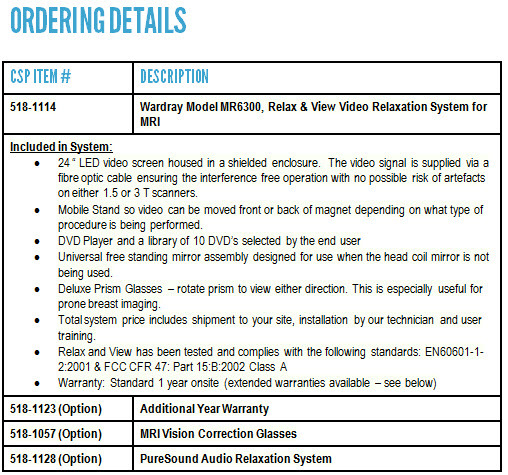 The Relax & View® Video Relaxation System provides a complete audio/visual experience while having an MRI. This helps to relieve the problems associated with the MR environment and to enhance the patient's feeling of well being. This also has a beneficial effect on staff. The Relax & View® Video Relaxation System is easily installed in existing MRI facilities without the need to ramp down the magnet. The use of advanced fibre optic technology for the delivery of the signal to the shielded screen enclosure ensures an artefact free scan under all conditions. The displayed image can be inverted and or reversed, so that no matter the orientation of the patient in the scanner, or the mirror configuration, the patient will always view the displayed image in its correct orientation. The audio side can be either connected through the scanner's audio system (if fitted) or through the PureSound Audio System (optional). It is also possible to supply a monitor with suitable mounting bracket to go in the patient waiting area which allows those waiting to watch the same DVD as being shown in the scan room.